Northbound along Interstate 35 in Burnsville. DRIVING INTO AND AROUND downtown Minneapolis always makes for an interesting experience. The Minneapolis skyline appears in the distance as we drive along Interstate 35 in Burnsville. This trip late Black Friday afternoon—not to shop but to visit family in the north metro—did not disappoint. I noticed a businessman texting on his drive home in heavy traffic. I spotted a junker van with a padlock attached to the exterior driver’s door, at about the location of the lock. I don’t have photos to prove either because by the time I realized what I’d really seen, we’d bypassed both. Duluth Trading Company’s billboard along Interstate 35 in the south metro. However, I did not miss photographing a Duluth Trading Company billboard for Buck Naked Underwear. I find these ads amusing. Signage for the “sane lane” nearing downtown Minneapolis. The blinding reflection of the sun. And I didn’t miss photographing the reflection of the setting sun off skyscraper glass blazing a blinding ball of fire into our eyes as my husband aimed our van toward downtown Minneapolis. The Minneapolis skyline as the sun sets. Creeping along in a congested area near downtown Minneapolis. As traffic thickened, Randy remarked that he is thankful he does not need to deal with rush hour on a daily basis. But at least we were moving, albeit sometimes barely, and traffic volume was less due to the holiday weekend. The slow-down gave me time to study the Minneapolis skyline. I can identify only the Foshay Tower and the IDS Center; it’s been decades since I’ve been downtown. Driving through the Lowry Hill Tunnel. Low light and a slow shutter speed created this effect inside the Lowry Tunnel. And then we were curving and zooming through the Lowry Hill Tunnel, which always feels visually surreal, as if we are inside an auto racing video game. Driving toward downtown Minneapolis from the north. Saturday morning, after staying overnight with our eldest daughter and son-in-law, we headed back toward the city on our way home. Behind the buildings in the foreground, you can see the pointed end of U.S. Bank Stadium. Another view of the stadium from the Interstate. My focus was on the new U.S. Bank Stadium under construction in the heart of downtown Minneapolis. To me, it resembles a ship rising from the urban core. A Minnesota Vikings ship. And so we drove south, clear sailing. No crashes. Light traffic. Out of the city. Back home to Faribault, fifty miles distant. I created this Thanksgiving display in a stoneware bowl. My sister-in-law Rena crafted the Thanksgiving card. DURING THIS THANKSGIVING WEEK, thoughts naturally turn to, well, thankfulness. Life has presented numerous challenges in recent years. But I still have many reasons to give thanks. Like most of you, the obvious food and shelter cannot be omitted from my list of blessings along with my family, my dear dear family. The extended Kletscher family poses for a photo on the Fourth of July 2015. Seven are missing. My nephew’s wife, in the purple-and-white striped shirt, gave birth to a daughter in August. Hattie joins two other great nieces, Sierra and Evelyn, born this year. What a blessing to have all of these new babies on both sides of the family. Minnesota Prairie Roots file photo 2015. In five more months, my immediate family will grow in size as my eldest daughter and her husband welcome their first baby, my first grandbaby. Excited? Yes, you betcha. I just know that my husband, Randy, will be a wonderful grandpa. He’s not the most demonstrative with words or emotions. But when it comes right down to it, he’s as good as they come. He works hard. He’s loyal and strong and smart. And funny. He makes me laugh. That is a blessing. Plus, he’s great with kids. Our 2 1/2-year-old nephew Landon, who moved a year ago to rural Faribault with his family, considers Randy one of his “papas” (aka grandpas). And then there are those close friends… Honestly, these are the people who are here for me through the ups and downs of life. They don’t judge. They don’t criticize. Rather they listen and encourage. They pray and support and show care and compassion. Life would be a lot harder without them. One of my favorite depictions of Christ, this one in a stained glass window at Trinity Lutheran Church, North Morristown. Minnesota Prairie Roots file photo. Which brings me to my faith. Thank God for God. And thank God we finally finished our basement project after more than a year. (OK, the steps aren’t carpeted yet, but I’m still calling the project done.) We now have a waterproofed basement with white walls and ceiling. The clean industrial look. Gone are the mold, dark paneling and red carpet. Totes are now neatly organized on a corner shelving unit. But the best part of all—the absence of mice after we uncovered, and sealed, their entry point. Everyone knows the arrival of cold weather in Minnesota brings mice inside. Given my love of words, I created this Thanksgiving display in my dining room with thrift store art and Scrabble letters. I’m not particularly fond of Minnesota’s cold and snowy months. But I am thankful to live in a state that embraces and supports the arts. In the past year, I’ve participated in three poetry readings, been published in two anthologies (poetry and creative nonfiction) and penned poems for a joint photo-poetry exhibit. All of these opportunities connect me to other writers. Minnesota truly is a great place to engage in all facets of the arts. That’s my post, labeled “Barn Memories,” featured on November 30, 2013, on Freshly Pressed. Daily, WordPress editors highlight the best content from WordPress sites in a section now tagged “Discover.” My work has been showcased thrice on Freshly Pressed. Minnesota Prairie Roots file photo 2013. Yes, I am thankful for you, dear readers. You are the best. Happy Thanksgiving! I purchased this vintage turkey candle several years ago in a Redwood Falls thrift store. The candle has never been lit and never will be. Read a related story on NPR about gratitude being good for the heart and soul. Click here. This concludes my three-part “blessings” series. Click here to read my first blessings post and then click here to read my second. You will also find this Scripture in St. Peter. The town. The words banner across the front of a house along South Minnesota Avenue/U.S. Highway 169 which slices right through the heart of this southern Minnesota community. I know nothing about the house—whether it’s home or business or something else. But I know that I appreciate the blessing of this bible verse upon travelers like myself passing through St. Peter. If you are traveling this holiday, may your journey be safe. Click here to read my first post in this three-part “blessings” series. Check back on Thanksgiving to read my personal list of blessings during the past year. WHEN THE MAIL CARRIER arrived at my door on Friday bearing a package, I was surprised. “I didn’t order anything. Who’s it from?” I asked. “Looks like it’s from a relative,” he said. And then I remembered my sister-in-law’s quick phone call several days earlier requesting my address. She was running errands and had no time to chat. This box with her return address solved the mystery of that call. Inside, I found several sweet surprises—a pillow, a book and a clutch of notecards. My niece worked all last winter stitching these yo-yos for this pillow. My 10-year-old niece crafted a yo-yo pillow for me. Fifty-six yo-yos, tiny circles of fabric gathered at the edges and sewn into circles stitched to a pink flannel pillow. Yo-yos were, Beth wrote in an attached note, popular during the Depression. 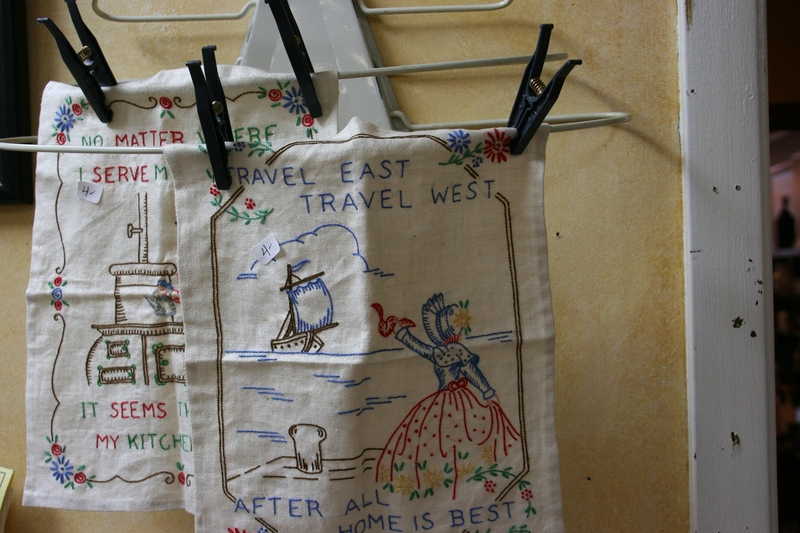 Women made them from scrap fabric (oftentimes from old clothing) and then stitched them into quilts. The story and history behind the yo-yo pillow. I made it for my Aunt Audrey’s birthday. She loves funky stuff and vintage, so I think she’ll like this pillow. Beth’s wrong. I don’t just like this pillow; I love it. And I like that my dear niece and her mom, Rena, know me so well. I do, indeed, value funky and vintage. 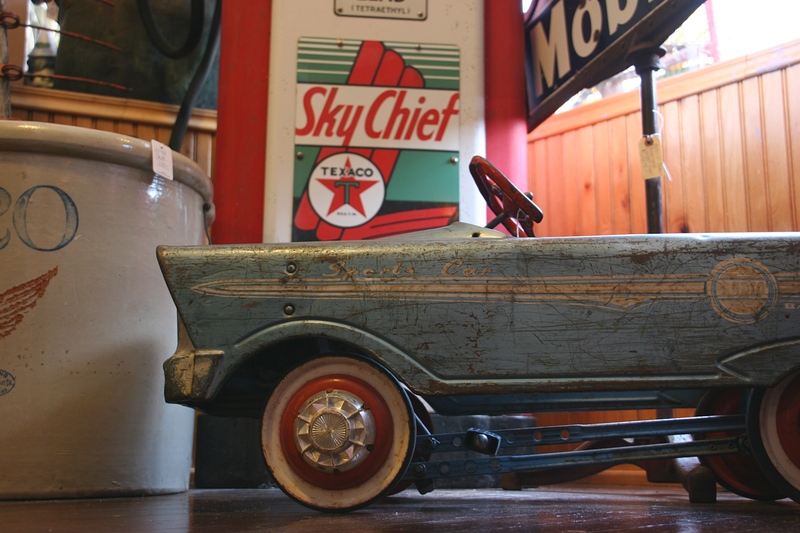 “When I discovered this historical gem from under junk and odds and ends (in a rummage store), I knew it was meant for you. Enjoy!” my sister-in-law wrote. This chapter explains how Land O’Lakes came to be the name of the Minnesota Cooperative Creameries Association’s butter. The Co-op launched a contest in 1924 to name its sweet cream butter, offering $500 in gold as prizes. Mrs. E.B. Foss of Hopkins and George I. Swift of Minneapolis submitted the same winning name. Contest entries of about 7,000 daily overwhelmed the company office. The contest topped news in the Midwest, second only to the Teapot Dome oil scandal, according to the author. That leads to the second gift, the book Men to Remember: How 100,000 Neighbors Made History by Kenneth D. Ruble. Land O’ Lakes Creameries, Inc. commissioned the volume published in 1947. Perfect for someone who grew up on a dairy farm. The “Spatial Odysseys” collection of notecards by David Paukert. The last item in the package—a collection of rural-themed notecards—is a fitting gift also. The cards feature the work of Michigan, North Dakota, photographer David Paukert. Titled “Spatial Odysseys,” the photo cards showcase fields, a church, a barn and more from Paukert’s “Visions of the Prairie” Collection. Prairie. That reflects me, rooted in the prairie. These gifts from Rena and Beth arrived at the end of a difficult week. They didn’t know this, of course, because the presents were originally intended for my birthday two months ago. But the timing of the delivery couldn’t have been better. Rena and Beth blessed me not only with the items they made and chose for me, but also with their thoughtfulness, love and care. This week, please consider ways you can bless someone. Call a friend or family member who needs your support and encouragement. Listen. Avoid “hearing without listening.” Send a card with a heartfelt handwritten note. Or a gift. Volunteer. Be kind. Show your love. In whatever way you can. Check back tomorrow for another “blessings” post. The Crow Bar & Grill, Courtland, Minnesota. Minnesota Prairie Roots file photo July 2014. EVERY SMALL TOWN needs a Crow Bar & Grill. For the food, the drinks, but, mostly as a community gathering spot. A place to lunch with friends and family and neighbors. A place to socialize and sympathize and support and celebrate. Thursday afternoon, Courtland, located along U.S. Highway 14 east of New Ulm, lost The Crow Bar to a wind-swept fire. It’s a devastating loss in a community of only 635. According to media accounts, the blaze started in the attic area and resulted in enough water and smoke damage that the bar and grill will be a total loss. But the destructive fire is about more than losing a building and a business. It’s also about the impact on locals. The Crow Bar & Grill, up close. Minnesota Prairie Roots file photo July 2014. Sunday morning I chatted with a friend and distant relative who, like my mom, has roots in Courtland. Howard is part of a Faribault-based accordion trio that recently entertained noon-time diners at The Crow Bar. Now he worries how his bachelor farmer brother will adjust to losing the place where he dined four days a week with friends. They’ll likely move across the street to Swany’s Pub. Yet, it won’t be the same, Howard says. That’s the thing about small towns. Businesses and people are intertwined in a way that stretches beyond the wallet. 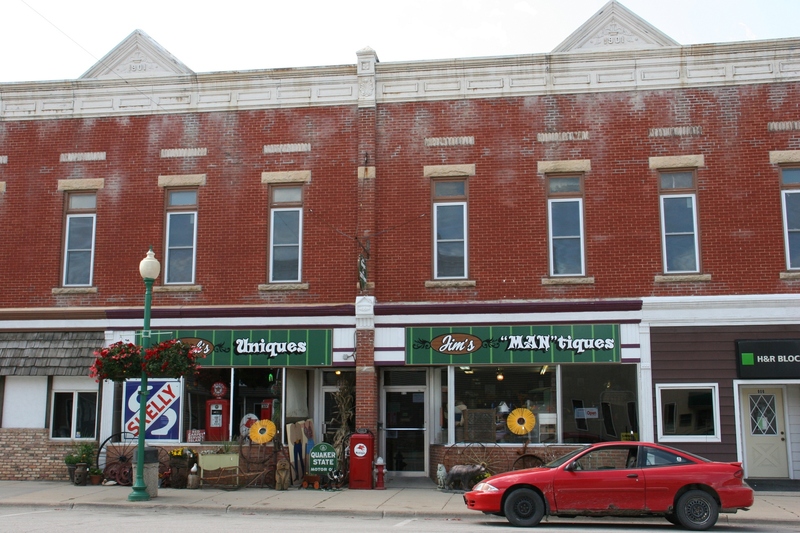 Locals hold emotional ownership in Main Street businesses. They care. Without them, businesses cannot survive. The Crow Bar wove into the lives of those who call/called the Courtland area home. Love great people that visit the crow. And one awesome owner and staff. The Crow Bar has the freshest burgers around! Great small town bar and bingo on Saturday is fun too! Hi From Pensacola Florida! Loved Courtland when I was there! Great food too yall!! Miss it still! The Crow Bar in Courtland advertises food specials. Photographed in October 2015 as my husband and I drove through Courtland. Shortly before noon on Thursday, with customers already seated inside The Crow Bar for their noon meal, the fire broke out. Everyone exited safely, including an upstairs apartment resident. My heart goes out to the folks of Courtland. Having grown up in rural southwestern Minnesota, I understand how devastating the loss of The Crow Bar & Grill to the community. When the lone cafe in my hometown of Vesta closed, residents rallied to build and open a community cafe. Courtland, at least, has Swany’s Pub. And, I expect with time, those who frequented The Crow will feel comfortably at home across the street. That’s the human, beyond-the-fire, side of the story. How will Courtland area residents adapt? How are they coping with the loss of a place that’s been a long-time part of their community? 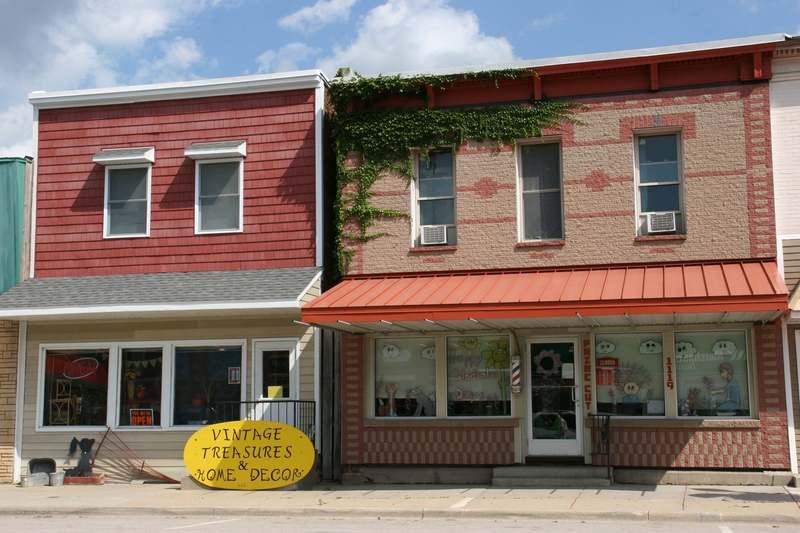 Vintage Treasures and Decor along Whitewater Avenue in downtown St. Charles, Minnesota. VINTAGE TREASURES AND HOME DECOR read the vivid yellow sign propped against a building in downtown St. Charles. That was enough to draw my husband and me into this newly-opened shop, relocated here from Byron. Posted, but not for sale. But before I show you some of the merchandise, let’s discuss that word vintage. What defines vintage? I turned to online dictionaries to find synonyms like outdated, old-fashioned and retro. I choose retro. That seems most applicable to the merchandise from my era that captivated me at Vintage Treasures. Groovy. 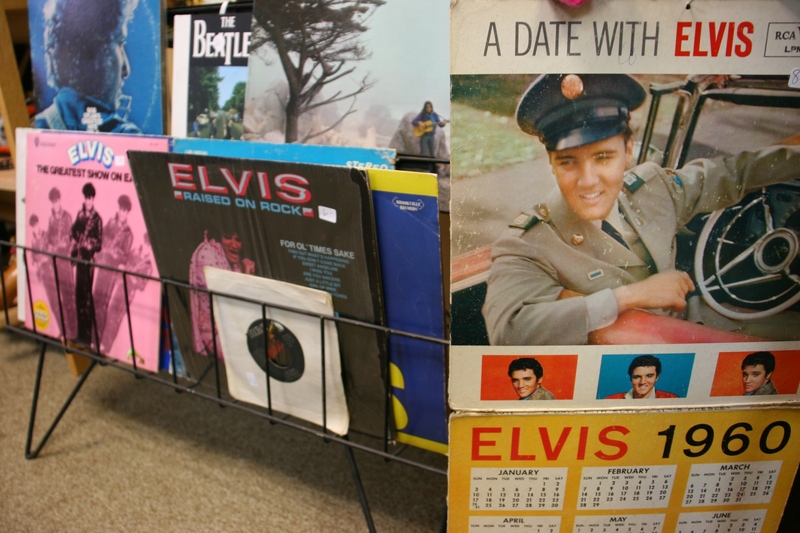 This merchandise display screams 60s and 70s. You can say all you want about the 60s and 70s, about hippies and Woodstock and peace marches and tie-dyed and psychedelic fashion. But it really was a memorable period in our nation’s history, a time when young people began to question the establishment and the choices made. Not that previous generations didn’t speak up. But the volume seemed louder, the voices more distinct, the opinions shouted in music and fashion and protests. 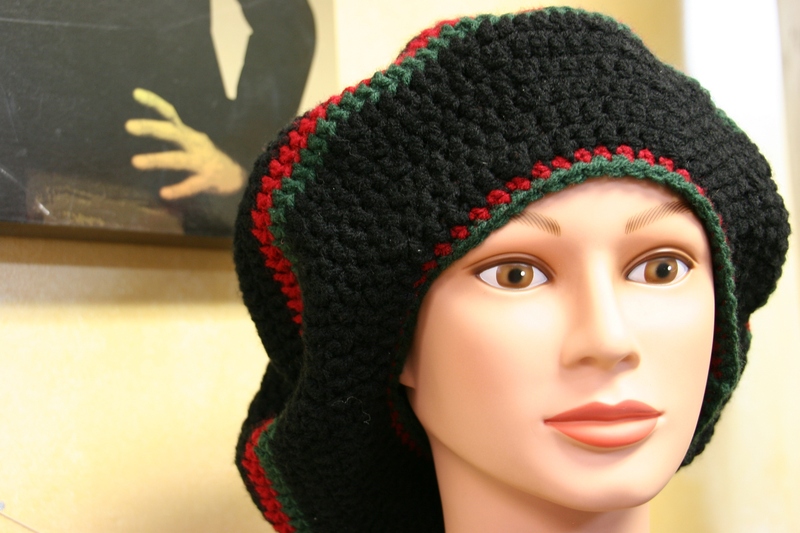 I remember crocheted berets (or tams) similar to this from the 60s and 70s. Personally, I was a shy teen coming of age in a rural area, far removed geographically from the unrest of the 60s and 70s. But I still cared. I kept up on current events, listened to rock-and-roll on KDWB, wore too-short skirts and flashed the peace sign. One of two retro trays I purchased. So when I discovered a section of retro merchandise inside Vintage Treasures, I flashbacked some 40 years. This was of my generation. 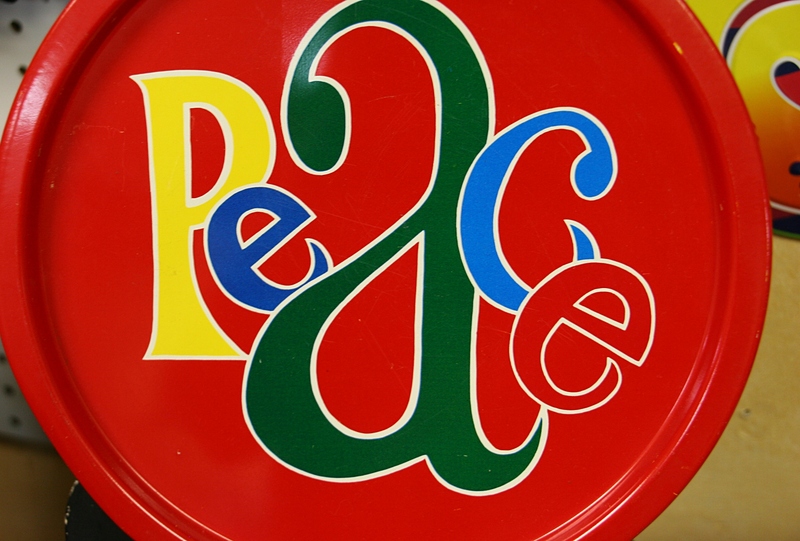 I didn’t need the retro tin Peace and Love trays I purchased for $2 each. But I bought them anyway and would have liked a third, except shop owner Laurie Rucker had already sold the others. Elvis was a little before my time. I’m thinking it would be fun sometime to host a 60s and 70s party. Wear tie-dye. Burn incense. Dip cubed bread into a cheese-filled fondue pot. Or maybe fruit into chocolate. Play some Beatles or Chicago. Serve beverages on those trays. Rock it out. Thoughts? On the definition of vintage? 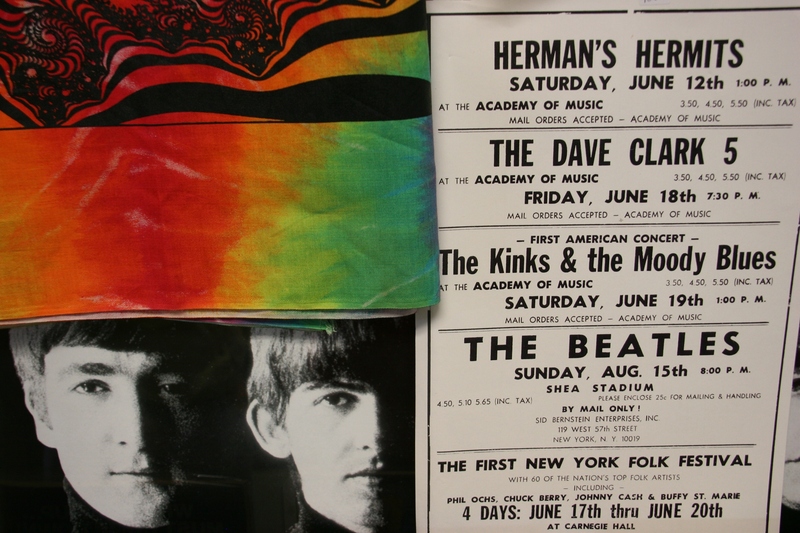 The 60s and 70s? 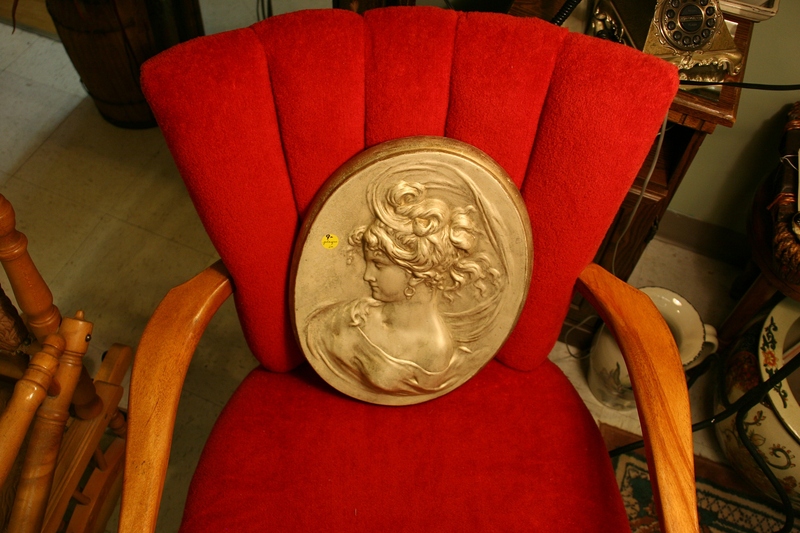 BONUS PHOTOS: Yes, Vintage Treasures and Home Decor includes more than hippie era merchandise and here’s a sampling. I remember one of my siblings having a papoose doll. 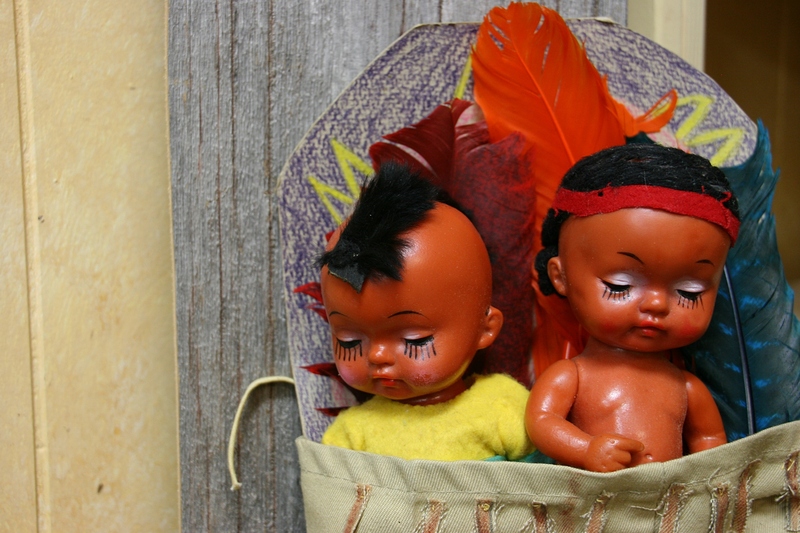 Although not politically-correct today, these dolls are part of our past. I always appreciate handcrafted, like these embroidered pieces. 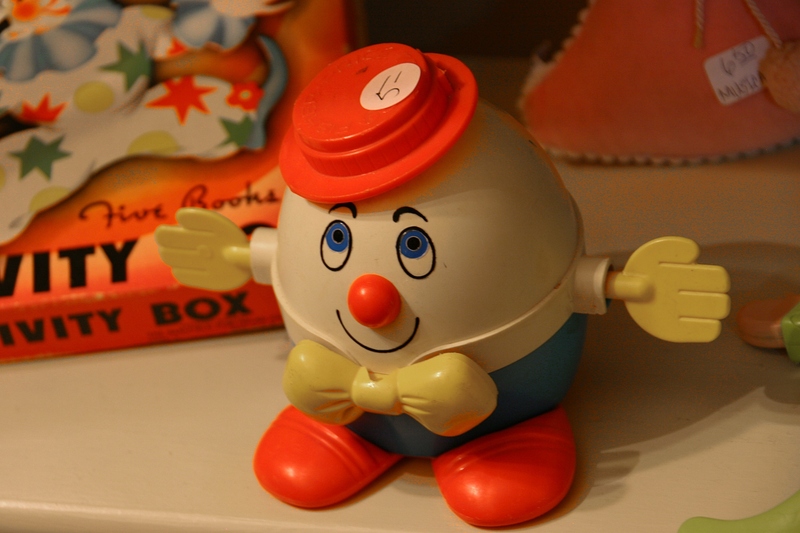 Humpty Dumpty, one of the toys in the toy area. 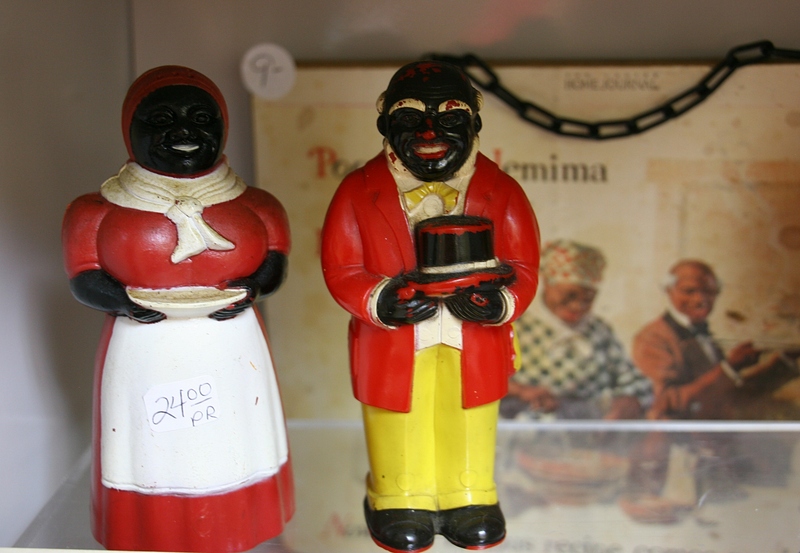 Aunt Jemima and Uncle Mose collectibles. FYI: Click here and here to read two previous posts I published in this three-part series from an early September stop in St. Charles. Sarah’s Uniques and Jim’s “Man”tiques recently moved into this aged building in downtown St. Charles, MN. MY HUSBAND AND I DELIGHT in perusing antique shops. We’re never seeking anything specific and seldom do we purchase anything. But occasionally we do. 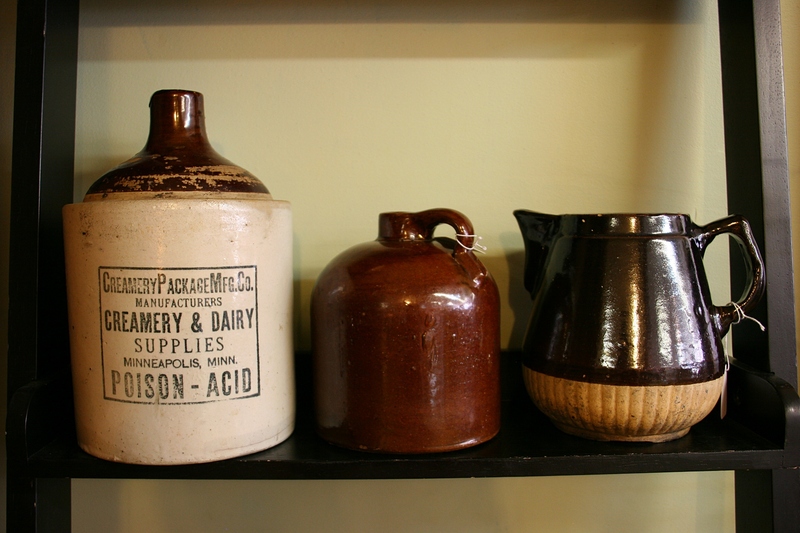 For us, antiquing is more about the experience, the memories connected to an object we discover on a shelf. A security mirror reflects inventory in a section of the shop. We found an especially lovely antique shop, Sarah’s Uniques and Jim’s “Man”tiques, during an early September stop in the southeastern Minnesota farming community of St. Charles. I love this couple’s shop. I love it for the variety of merchandise showcased in a way that’s artful, sectioned by themes (not disordered clutter), surprising and inviting. This pottery is displayed as if in a gallery. 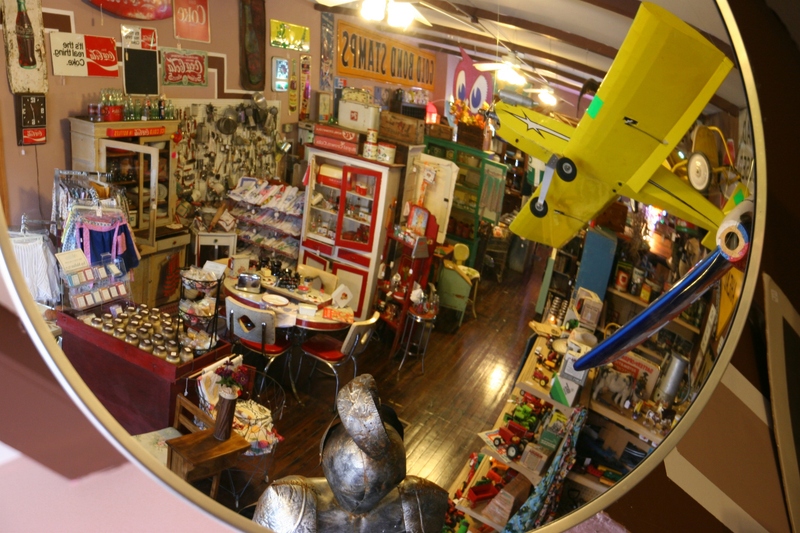 Oftentimes I become visually overwhelmed by antique shops crammed with too much merchandise. Sarah’s and Jim’s offers a lot, but in an organized, creative sort of way. There’s plenty to interest both men and women. A kid’s toy car pulled up to the gas pumps. Steer around the bear rug to get to the pumps. 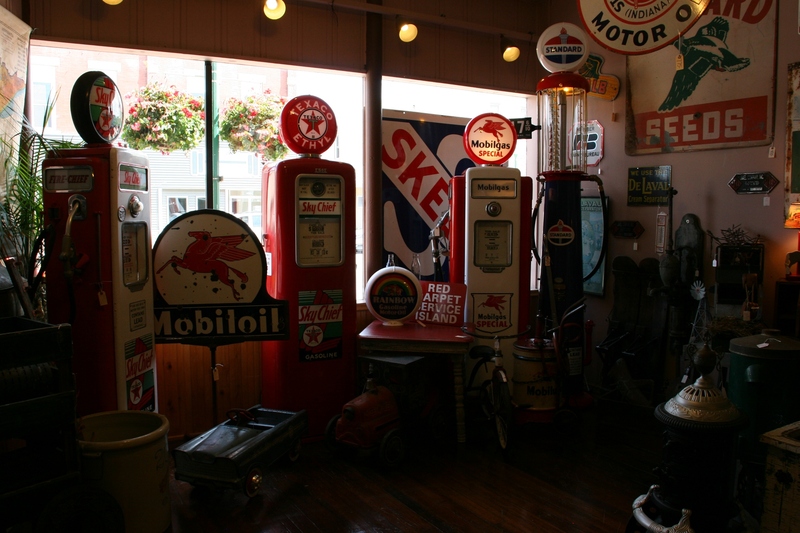 If you’re into gas station memorabilia, you can detour into the section of old gas pumps. 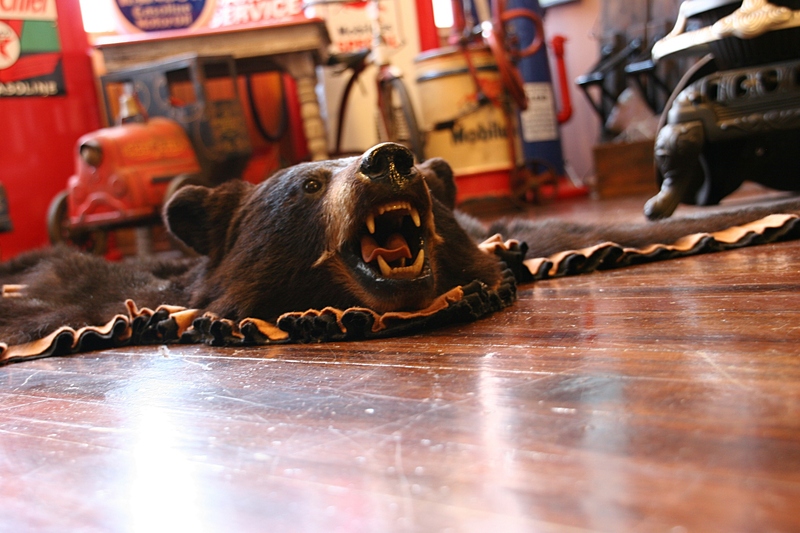 Just veer around the bear rug. This was not with all of the other horse stuff, but would certainly have fit there. 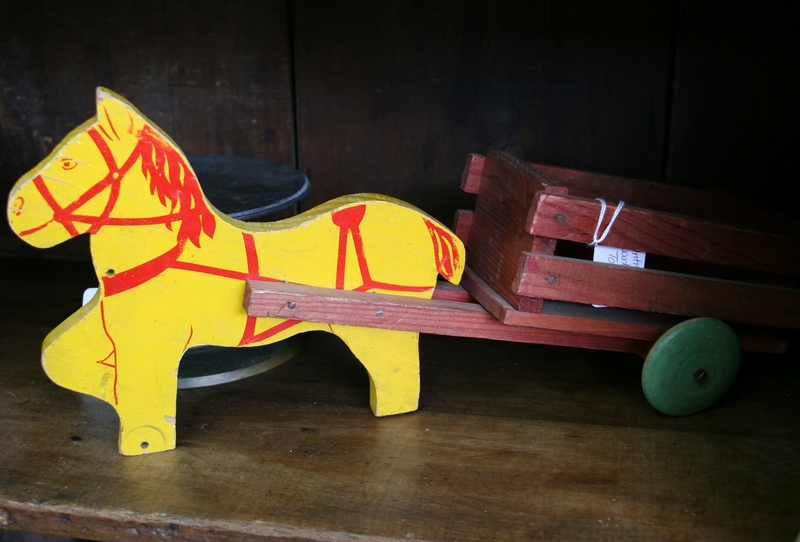 In a small room, horse-themed items—including stirrups—entice equine appreciators. Or you might find a book like Singing Wheels, which I remember from my youth and which a customer snapped off a shelf. Remember Red Owl and Gold Bond stamps? 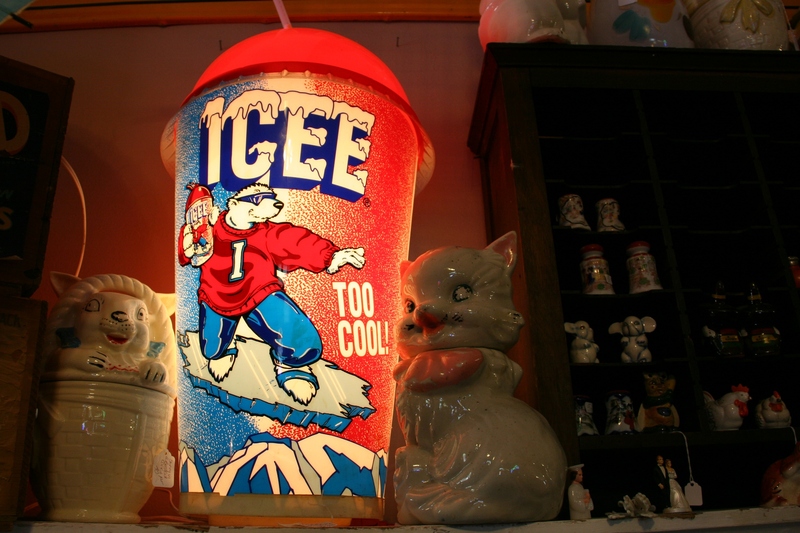 Or fixate on grocery store memorabilia. 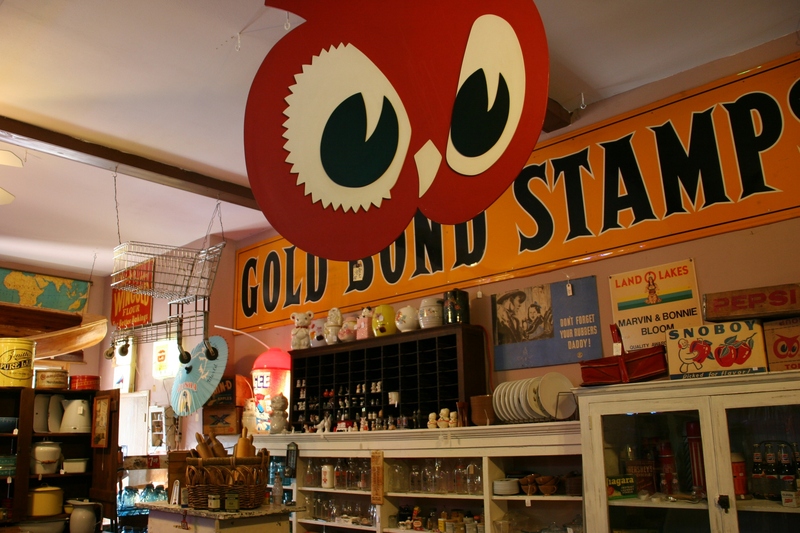 What fun it would be to own the Red Owl sign, reminding me of that now-defunct grocery store chain with the cute check-out boys who carried grocery bags to my parents’ Chevy. 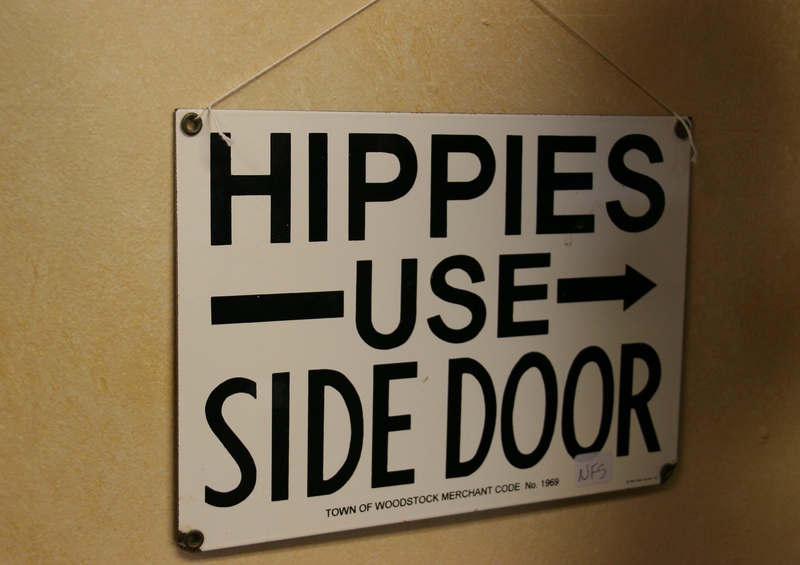 An antique shop can even offer unexpected humor. 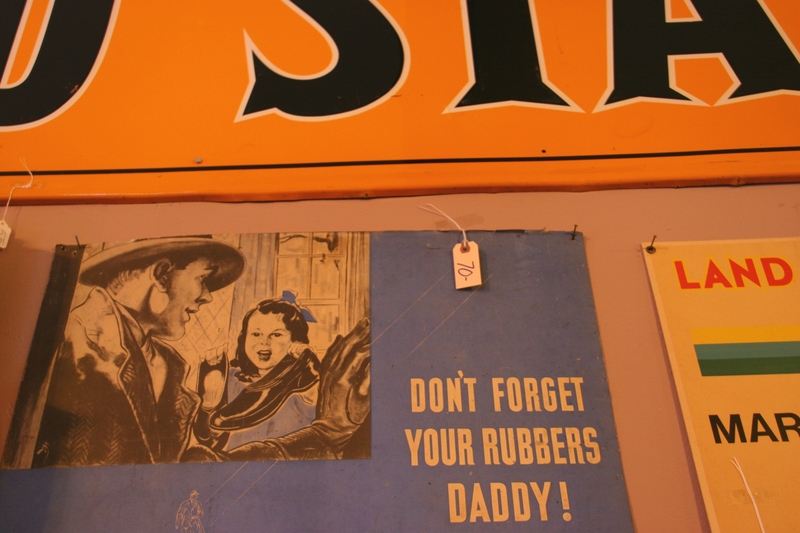 Randy and I chuckled at the signage about rubbers. We remember when rubbers were merely a protective covering slipped over shoes. 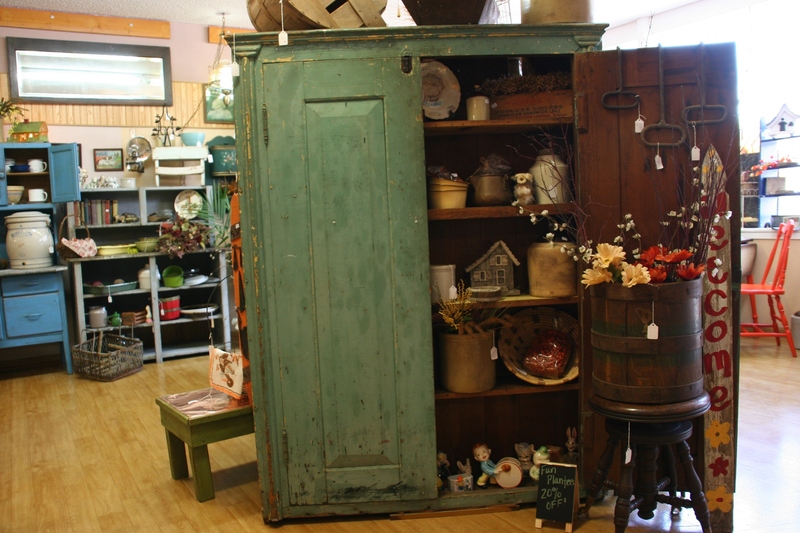 This beautiful cupboard was acquired from a local and had been in the family for generations. It’s not for sale. No matter how many antique shops I’ve shopped, I find they are all different—some musty holes in the wall while others gleam. Organized or chaotic. If I was rating antique shops, I’d give Sarah’s and Jim’s five stars (out of five). It’s that outstanding. One sweet surprise in the small town of St. Charles. 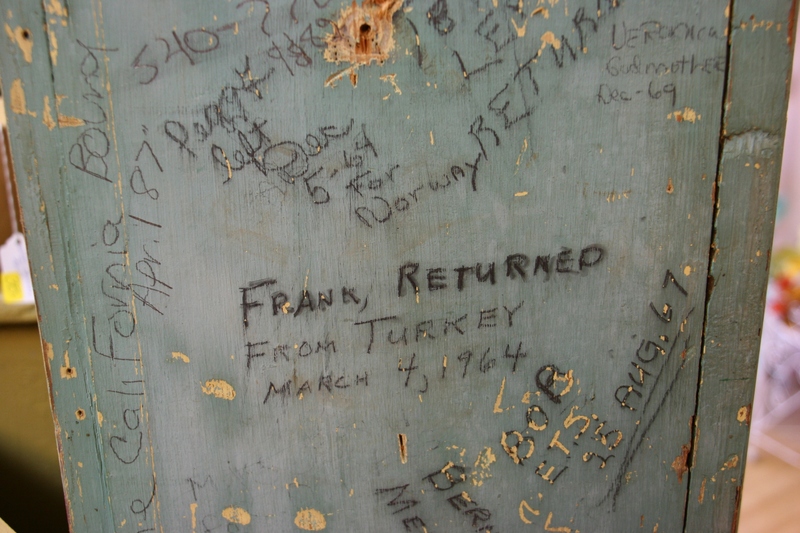 On the side of the cupboard, family members recorded their travels abroad, during the early years to serve in the military. 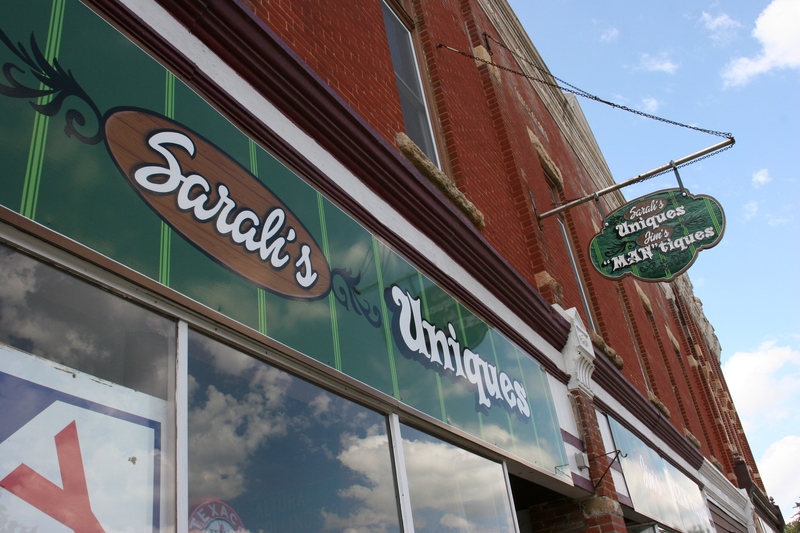 Sarah treasures that detailed history, the reason the cupboard is not for sale. And, bonus, co-owner Sarah Kieffer is the type of shopkeeper who welcomes customers (and browsers) with genuine warmth. 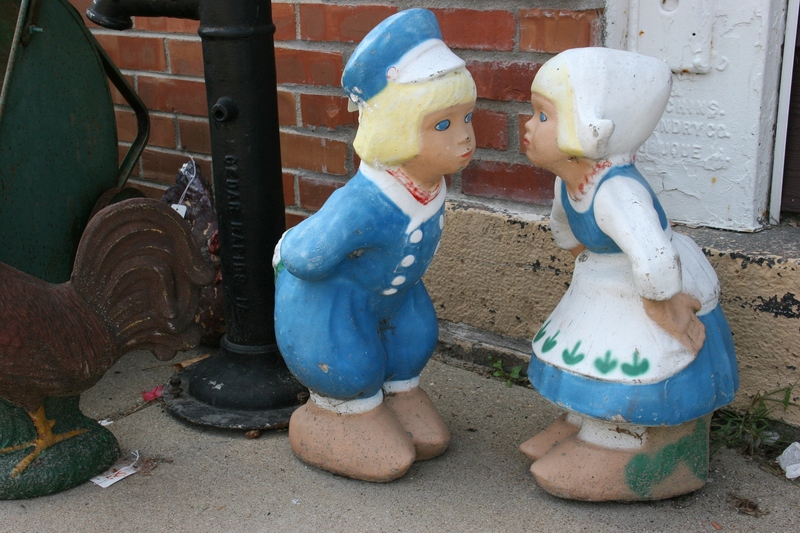 Her friendliness showcases the passion she holds for merchandising antiques, primitives and collectibles. That attitude brings folks in the door, to browse and to buy. 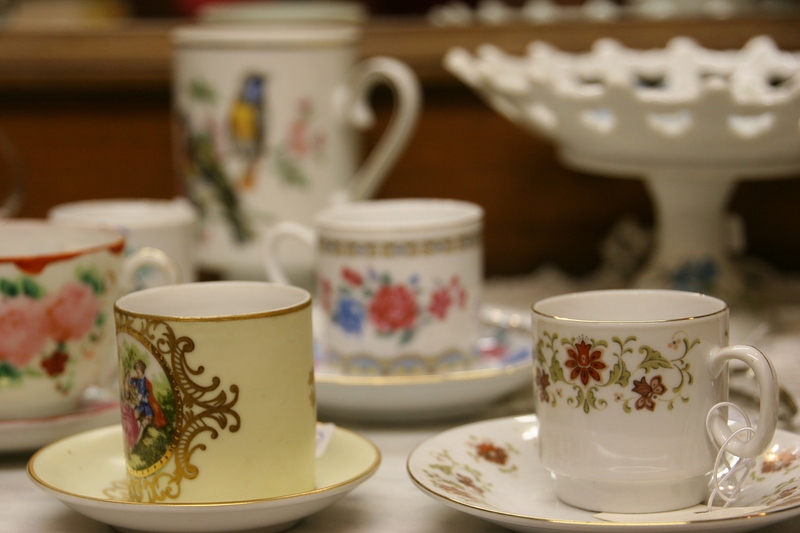 Dainty cups and saucers for the collector. 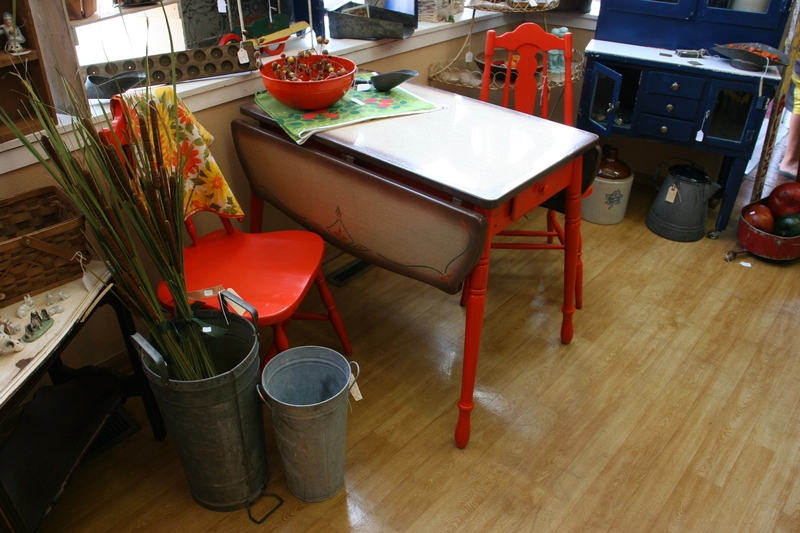 A unique table paired with orange chairs punches color. 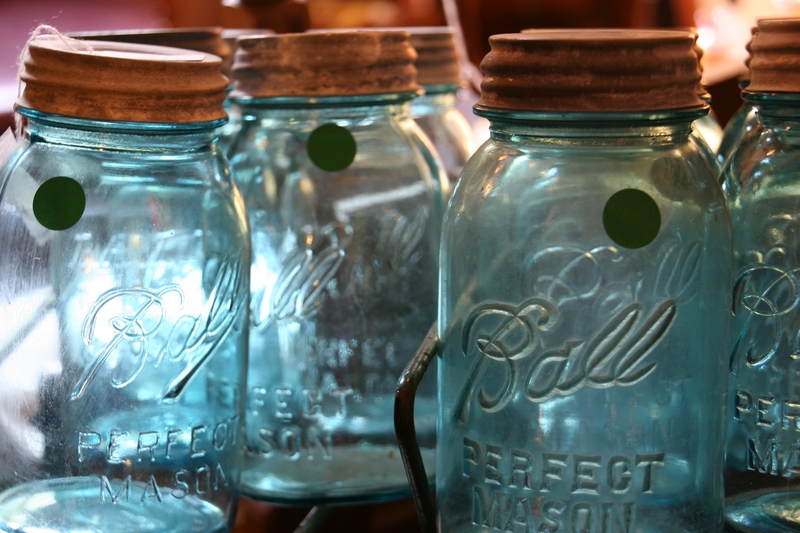 Mason jars, especially blue ones, hold timeless universal appeal. 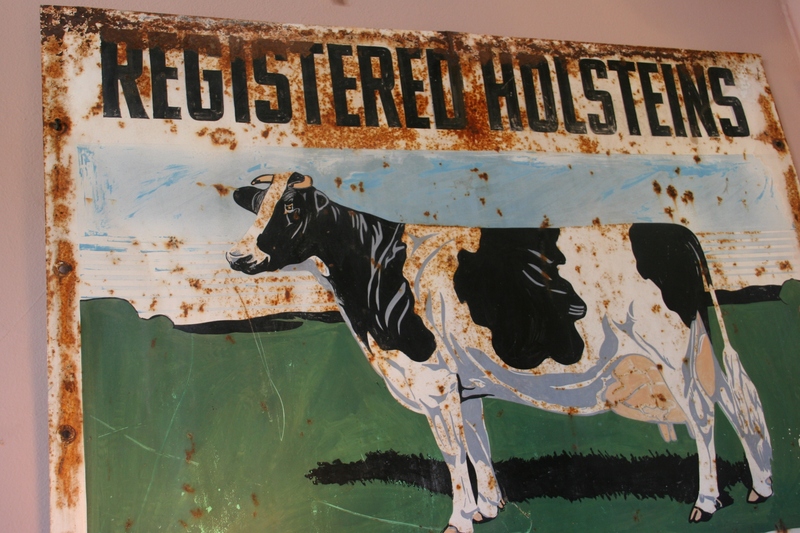 I grew up on a dairy farm, so this sign caught my eye and my heart. Likewise these farm notebooks reminded me of my farmer dad. 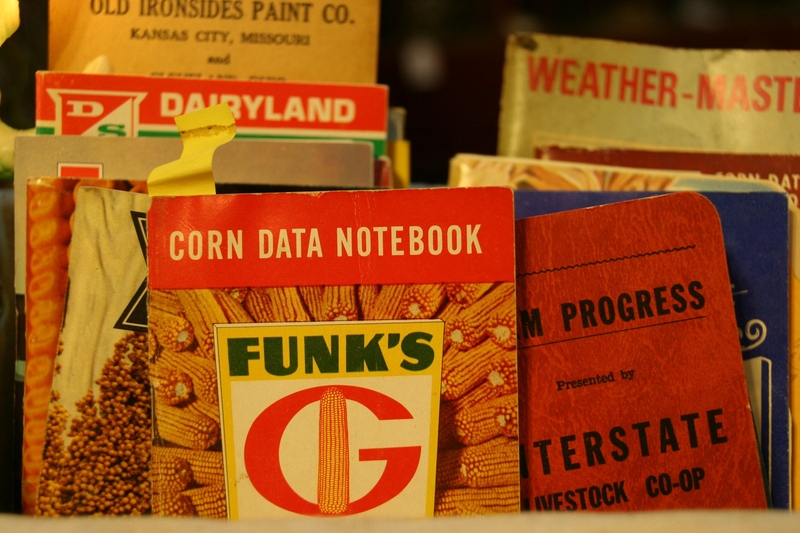 I loved when he would give me a notebook like the Funk’s one. Outside the shop I saw this cute Dutch couple. Not something I would collect. 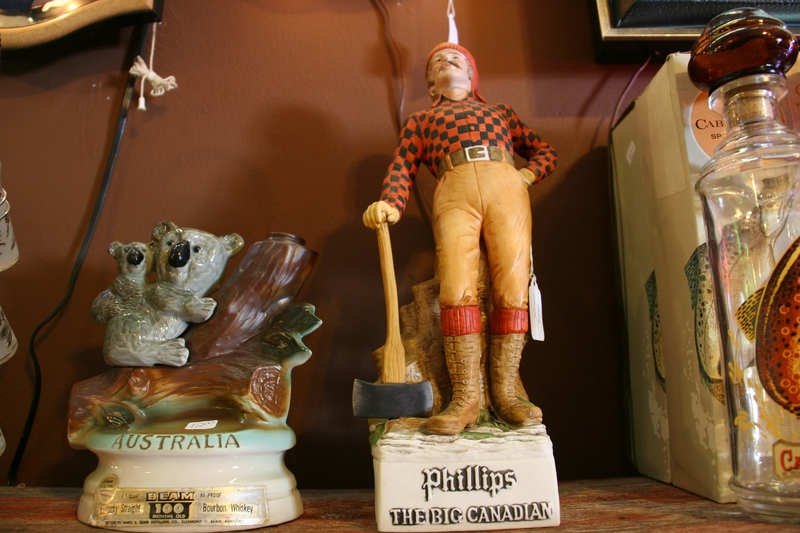 But I definitely like the Paul Bunyan art. Fitting for Minnesota. A clean canvas for art. A close-up look at the exterior signage. 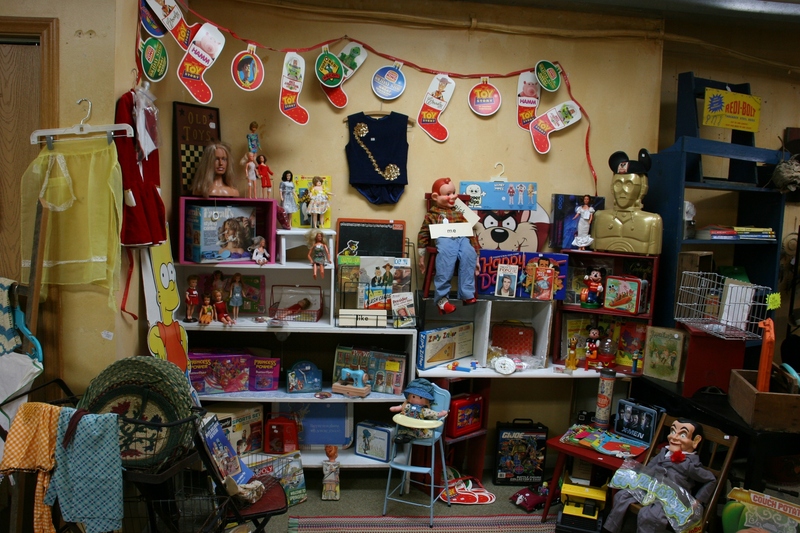 FYI: Sarah’s Uniques and Jim’s “Man”tiques is located at 912 Whitewater Avenue in the heart of downtown St. Charles. Check back tomorrow when I’ll show you another antique shop across the street. And click here to read my first post in this series from St. Charles.